The initial requirement to discuss this subject is to establish why Hamas matters and what their view is. Hamas matters because in an election held in Gaza they received over three-quarters of the votes. Many polls of the Gazan population have shown over eighty percent of Gazan support firing rockets into Israel. The leadership recently was passed on and the new person who is responsible for day-to-day activities and reality in Gaza was passed to Yahya Sinwar. 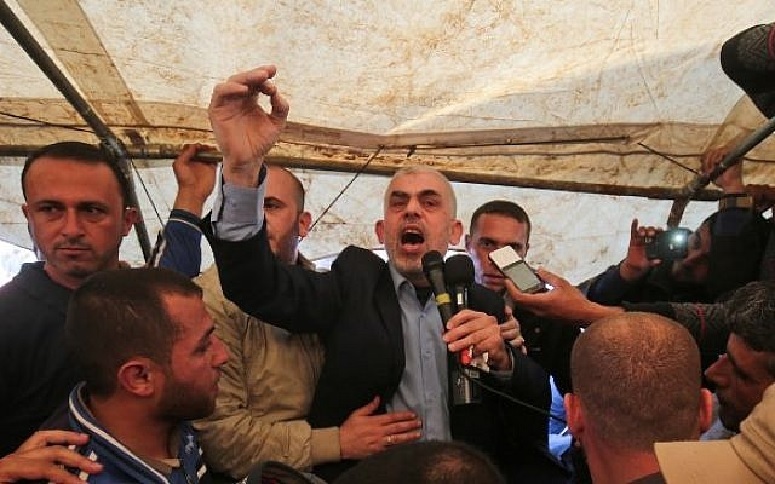 We recently were provided with statements made by Hamas leader Yahya Sinwar who stated, “eat the livers of those besieging” as well as “tear out their hearts from their bodies.” Such statements do not leave much room for doubt. Additionally, Yahya Sinwar has declared, The March of Return will continue,” Sinwar said. “It will not stop until we remove this transient border.” On the violent riots and attempts at the border that Hamas refers to as the “March of Return,” he additionally stated, (The) “March of Return affirms that our people can’t give up one inch of the land of Palestine. The protests will continue until the Palestinians return to the lands they were expelled from 70 years ago.” What must be noted of great importance is his reference to seventy years ago. Seventy years ago was the year 1948, the year when Israel came into existence. He is simply declaring that the violence in one form or another, mass rioting on the border, tunneling into Israel to attack Israeli civilians, firing rockets over the border targeting Israeli communities, flying kites with incendiary explosive devices over the border intending to burn crops or peoples homes or businesses or other properties, and new forms of violence we have yet to witness as well as military action should they receive sufficient provisions to be a potent enough threat to invade Israel, all until Israel is completely destroyed and the Jews eradicated. This is the view from Hamas and thus the generally accepted view of the vast majority of Gazans. To reach an agreement with Hamas and the denizens of Gaza, the Jews in Israel would need to flee, commit suicide or allow Hamas and the Gazans to slaughter them while the remainder of the Israeli population would have to decide to live under Sharia with Hamas as their permanent governance or fleeing. Hamas will not stop violent resistance and insurrection until they erase Israel or something very much dramatic should occur. Even if Hamas were forced from Gaza along with their supporters into the Sinai Peninsula, they would carve out an area on the Israeli border where they would fight any Egyptian forces while continuing to attack Israel. Read that again, Hamas pushed from Israel would remain on the Israeli border and fight Israel while also removing any remnant of Egyptian authority even if such would require Hamas to fight a war with Egypt. This would end up placing Hamas backed by Iran and potentially reinforced by IRGC troops sent by Iran fighting against Egypt unless Egypt simply surrendered their border area with Israel to Hamas and Iran. This would provide Iran with another border where they could place their troops along the border with Israel in addition to the Lebanese and Syrian borders. So, if Israel were to push Hamas and their supporters out of Gaza into the Sinai Peninsula, that would very definitely make Egyptian leaders very upset as they have enough problems with the terrorist and criminal entities currently populating much of the vast Sinai Peninsula, and to Israel it is very large, almost three times the size of Israel. Pushing Hamas from Gaza thus would not only not resolve the problem; it would also make problems for Egypt who would rightfully blame Israel for this added distress. But that would be but a small part of the added problems such would cause. Additionally, pushing Hamas into the Sinai Peninsula would make the problem a factor of over four from fifty-one kilometers to two-hundred-sixty-six kilometers. What would make things exponentially worse is the fact that once established on the Egyptian side of the Israel-Egypt border, Hamas would gain access for importing heavy weaponry and whatever provisions they might desire by simply using the Red Sea or Mediterranean Sea as well as the smuggling routes already existent within the Sinai Peninsula. Where Israel might be capable of patrolling the Red Sea and the Mediterranean Sea where they border the eastern leg of the Red Sea and the northern Sinai Peninsula along the Mediterranean Sea, the western leg of the Red Sea is largely within Egypt and thus Israel would need to rely on Egypt to patrol this region. As this is also the route taken by shipping using the Suez Canal, patrolling this region would be next to impossible. The result of these conditions would result in a far more dangerous and heavily armed Hamas with provisions of any nature which Iran might decide to provide. This could include tanks, heavy mobile artillery, far larger missiles with advanced guidance systems, anti-armor weaponry far more advanced than the current level, more advanced anti-aircraft weapons including MANPADS and if they establish a region of sufficient size, they could be provided with aircraft and pilots. The simple point is that with Hamas in Gaza, Israel is capable of enforcing a blockade permitting all non-military use goods to pass including all humanitarian provisions while preventing military and other weaponry. Egypt also has a similar blockade on Gaza which permits in negligible aid when compared to the amounts which pass through Israel into Gaza. The problems of losing control prevents Israel simply pushing Hamas out of Gaza into the Sinai Peninsula as this would, with time, make Hamas into another Hezballah with over one-hundred-fifty-thousand missiles and rockets all aimed at Israel now along the southern Egyptian-Israeli border just as Hezballah has along the Lebanon-Israeli border and now the Syrian-Israeli border. Pushing Hamas from Gaza would actually be counter-productive. That leads us to the big question, what option does Israel have concerning Gaza as continuing with the threat growing constantly more dangerous is completely unacceptable. Israel would be foolish to push Hamas along with Islamic Jihad into the Sinai Peninsula for the reasons above. This would mean that the reconquest of Gaza allowing the leadership and other members of Hamas and Islamic Jihad to escape is not a viable solution. Any point at which an Israeli intervention into Gaza would begin to give the hint that this was not going to be another smash and leave operation but a complete reconquest, the leadership of Hamas and Islamic Jihad would do everything in their power to escape to the Sinai Peninsula, something which must be prevented. 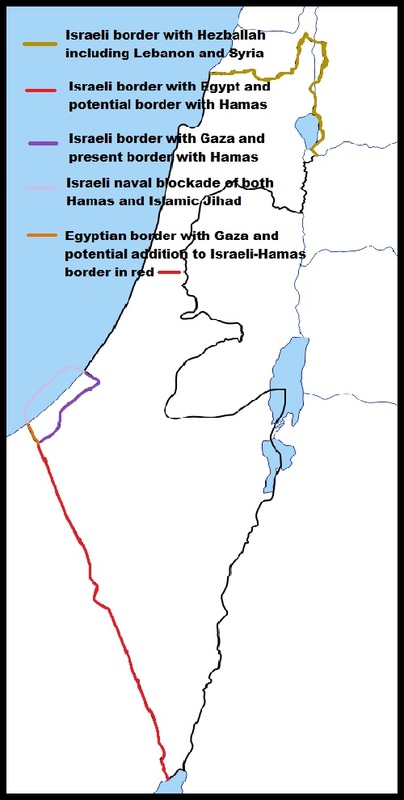 This would require more than simply taking the Gaza side of the Gaza-Egypt border as it is assured that there exists more than one escape tunnel leading from their network surrounding their command bunker in the sublevels of the Shifa Hospital into the Sinai Peninsula crossing either under the Egypt-Gaza border or even passing under the Mediterranean Sea and back into the Sinai Peninsula. Israel would need to take all these separate tunnels and do so before the leadership under the Shifa Hospital could discern what Israel was planning. The simple and only means of reaching peace on the Gaza border would be to destroy the entire leadership of both Hamas and Islamic Jihad and completely cleanse Gaza of all weaponry and weapons manufacturing facilities. The factories can be left intact but the forms and molds for making rocket engines and as much other dedicated weapons machinery would need be destroyed or confiscated. It is understandable that not all such machinery can be removed as some equipment is dual use and thus legal, but taking the vast amount and the dies for making the rocket and mortar components would set back production to such a point as to remove much of the threats. Further, those who manufacture these weapons would be amongst the Hamas officials who would be on the Israeli lists of wanted personnel, which would start with Yahya Sinwar. Lastly, any Hamas officials who might escape would need to be placed on international arrest warrants by Israel and any other nations who would also desire to remove these terrorist leaders from becoming a threat. One item of interest is that despite his brave words, Yahya Sinwar has not been an active member in the border rioting. He has not joined those slinging rocks across the border, those flying kites with incendiary kites over the border, those cutting the border fence attempting to cut holes through which to pass, those crawling to the fence with weapons to shoot at IDF positions nor those burning thousands of tires to produce smokescreens. Yahya Sinwar has appeared one morning at the aid station over half a kilometer behind the active rioting where he delivered his great speech declaring, “The protests will continue until the Palestinians return to the lands they were expelled from 70 years ago.” This has been his contribution, the man who used to be the commander of the militant arm of Hamas and now its absolute leader within Gaza, shouting where the media could cover his brave outbursts demanding the followers risk their lives committing acts of violence and war against Israel. It is an act of war to hurl incendiary devices onto fields of crops causing close to twenty-million dollars in damage and soon to surpass even that number. It is an act of war to attempt to force a mass border transgression with the intent of murdering the civilians of another nation. It is an act of war to fire upon border agents of a neighboring nation. It is an act of war to purposely destroy border-monitoring equipment with the intent of allowing for an invasion or the incursion of a small group to conduct terrorist attacks. It is an environmental act of war to pollute the air across a border through the burning of tens of thousands of tires causing noxious smoke to cover acts of aggression and attempted breaching of the border to conduct acts of terror. It is an act of war to have leaders demand people riot on the border with the intent of their actions leading to the destruction of another nation. The actions which Hamas and Islamic Jihad have been taking on the border with Israel are sufficient provocation which any other nation would have used troops to bring such actions to an end removing any threat posed. Such actions would be legal under international law as explained in this article, “Anticipatory Self-Defence Under International Law” (PDF File). The rioting and the entire coverage by the world media have been disgraceful. Their depiction of everything being an orderly, peaceful, benign, civil rights demonstration has been literally turning a blind eye. The stringers are providing the media with their stories as they sit calmly and safely on the Tel Aviv beach at their favorite coffee bistro, sleeping in their five-star hotel, and eating in the finest restaurants. These stringers are mostly Hamas propaganda operatives, better known as trusted sources within Gaza. These stringer know to stand exactly in the middle of the entirety of the action with the rioting and violence on one side and the peaceful scenes of families having picnics and kids playing soccer, of men kneeling in prayer and the aid tent treating the injured, and they know to face away from the rioting when aiming their cameras except to take a video of a group rushing by with a person on a stretcher. We showed one of their videos which showed a youth on crutches who suddenly was capable of fleeing with great alacrity despite his crutches which he held over his head waving them in the air, suddenly he was perfectly capable and no sign of a limp. (video can be watched in our article here) This has a name here calling it Pallywood. The media in Hamas has their stories and pictures checked by minders from Hamas and if they hope to continue covering things as they occur in Gaza, then they must keep to the dictated lines of propaganda. There is a limit to what is permitted to be shown through the Western Media to their viewers and break these rules and you no longer are provided with coverage. Lose your ability to report on the happenings in Gaza and you might also lose your position, your employment. This is why the major media companies’ reporters use the stringers which Hamas assigns them and choose to sit in Tel Aviv all comfortable and safe. What is also interesting is that reporters can freely report from inside Gaza knowing they are safe from injury but the same is not true from the Israeli side. Think about this for a minute, it is not because the Israelis are more dangerous, it is because the Israelis are in greater danger of being shot. In Gaza, you know that unless you are very unfortunate, you will only be targeted if you are performing an act of aggression. If you are with the IDF forces and poke your head up to take a picture or shoot a video, you are very likely to be shot by a sniper from within Gaza, a Hamas or Islamic Jihad sniper. The reality is very different from reported and the solution is definitely different from reported. As far as the Deal of the Century from President Trump, it will be dead on arrival, as Mahmoud Abbas will refuse anything which permits Israel to exist as the Jewish State; and Hamas, under Yahya Sinwar, will not even be read as long as Israel exists and it would not be necessary should Israel cease to exist. The simple truth is the Palestinian Arabs from both societies under their current leadership and any leadership in the foreseeable future have one stipulation for peace, no Israel and no Jews. It really is that simple, and Israel simply refuses to commit suicide, thank you. What Should Israel do to Mitigate the Portman Controversy? Before even approaching this subject, it will be necessary to make an assessment of why Ms. Natalie Portman decided to refuse the 2018 Genesis Prize. Initially, she had appeared to be extremely excited and honored to be receiving this prize and looking forward to the ceremony despite the fact that Prime Minister Bibi Netanyahu would also appear and make a speech. She initially had no problem sharing the stage with the Prime Minister, the same person she claimed was impossible for her to appear alongside as part of her reasons for refusing the award subsequently. Early last November she exclaimed, “I am deeply touched and humbled by this honor. I am proud of my Israeli roots and Jewish heritage; they are crucial parts of who I am.” Additionally she reacted, “I am particularly inspired by the opportunity to make an impact on women’s issues in Israel…Israel has already achieved much in terms of social and economic development, education and science, and we can all be rightfully proud of it as Jews…” And a last quote of her reaction is as follows, “It is such a privilege to be counted among the outstanding Laureates whom I admire so much. I express my heartfelt gratitude to the Genesis Prize Foundation, and look forward to using the global platform it provides to make a difference in the lives of women in Israel and beyond.” These quote came care of INTO THE FRAY: Natalie Portman as a symptom written by Dr. Martin Sherman, an opinion author we often read and have found to often put forth profound thought. We have established that initially Ms. Portman was eager, honored and desirable of receiving the Genesis Prize. So, what happened? Her initial claim was that the violence on the Gaza border was a large mitigating factor and that she found the Israeli actions abhorrent and she could no longer receive the award. Portman said later in a statement posted on Instagram, “Let me speak for myself. I chose not to attend because I did not want to appear as endorsing Benjamin Netanyahu, who was to be giving a speech at the ceremony. Like many Israelis and Jews around the world, I can be critical of the leadership in Israel without wanting to boycott the entire nation,” Up to this point, her reasoning was purely political but confusing as she knew when she initially was reacting to being chosen that, as we already stated, knew that Prime Minister Bibi Netanyahu would be attending and making a speech and sharing the stage. But then she goes off the rails making a vacuous statement which starts with a completely incorrect claim that Israel was founded to be a refuge for the survivors of the Holocaust. We have to take into consideration that she is an actress whose fame is for her physical appearance and ability to repeat lines with the proper emotion, definitely a talent but not necessarily requiring any actual knowledge of history, something often proven by today’s actors and actresses. Israel was set into motion by the 1917 Balfour Declarations and codified in the 1922 San Remo Conference and restated in further treaties and the Mandate System set in place by the League of Nations and all recognized under Article 80 of the United Nations Charter. Her following statement goes, “Israel was created exactly 70 years ago as a haven for refugees from the Holocaust. But the mistreatment of those suffering from today’s atrocities is simply not in line with my Jewish values. Because I care about Israel, I must stand up against violence, corruption, inequality, and abuse of power.” This last statement is definitively telling and on this we shall discuss as it describes Ms. Portman’s refusal, the support of the BDS Movement by the late Stephen Hawking and the numerous performers, both actors and musicians, who have cancelled tour appearances or declined making appearances in Israel, particularly Tel Aviv which is largely secular and very liberal. What happens often in these cases is that the BDS Movement has a system which is largely financed by the Arab League and numerous Arab nations and which was initiated by the PLO when they supported boycotting Israel which was quickly adopted by the Arab League and eventually was transformed into the BDS Movement as the Arab boycott of Israel was too restrictive and the BDS Movement took the Arab boycott into the leftist mainstream. Since then, the BDS Movement has gained in sophistication and financing has increased and numerous leftist NGOs have adopted the BDS boycott of Israel. Some of the groups supporting BDS Movement against Israel include; Black Lives Matter, International Solidarity Movement, Olive Tree Initiative, Palestine Summer Encounter, IfNotNow, Adalah, Campus Action Network, Christian Peacemaker, Friends of Sabeel, Interfaith Peace Builders, National Lawyers Guild, Presbyterian Synod, Rachel Corrie Foundation For Peace and Justice, US Campaign for the Academic and Cultural Boycott of Israel, United Church of Christ Palestine/Israel Network, United Methodist General Board of Church and Society, Women in Black, Women’s International League for Peace and Freedom, Council on American Islamic Relations, If Americans Knew, Muslim Public Affairs Committee, Muslim Students Association, Council for the National Interest, International ANSWER, International Socialist Organization, Jews For Justice For Palestinians, La Voz De Azatlan, La Raza, Middle East Studies Association, Nation of Islam, Veterans For Peace, Who Profits and finally, of no surprise, the American Nazi Party. Then, of course, there are numerous people of wealth who also assist financing the BDS Movement which can be found here along with a more complete list of organizations and NGOs as we only took the majority of those listed. Still, with these numerous mostly leftist organizations, there is no problem getting people to volunteer to make phone calls to whomever is the target of the moment, send e-mails from as many accounts as each has set up for their use, and make other communications making the target believe that there are millions who would never buy their albums, books or other goods or services or would no longer go to movies or plays in which they appear which can make some weaken and decide it is not worth one stop on their tour to risk this loss of support. But for others, such as Ms. Portman, there is another force in play and this is what we believe likely is what was largely behind her rejection of the award, namely peer pressures. The Hollywood crowd is not exactly known for their support of Israel just as they are not known for their support of President Trump. Israel’s main crime is that first off it is a very religious nation which in Hollywood means they are backward and ignorant. Further, Israel has repeatedly elected conservative governance which is another sign of retardation and a sick population in the minds of the mental giants in Hollywood. The real problem is that Hollywood has a herd mentality and the leadership has decidedly chosen the far left to the point that to be part of the “in crowd” in Hollywood, you have to pass a litmus test proving that you are a strong leftist and believe as the politics chosen by the crowd. Part of that politics is to support all the leftist political movements which includes the BDS Movement because it supports the Muslims who it has been decided are the downtrodden and victims in the world as well as being thought to be people of color despite the fact that being a Muslim says nothing about your pigmentation as it is a religion, not a race. Still, this measure makes Israel the greatest evil on the planet as the Muslims desire that Israel be eradicated and thus to be part of the accepted crown in Hollywood, you must hate Israel. 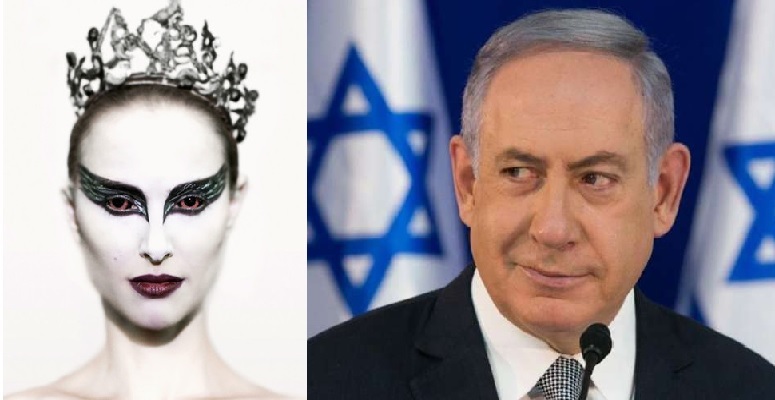 Ms. Portman was likely informed by numerous of her “friends” that she must refuse this “Israel” award, especially if she desired to be invited to the “in” parties or be considered for any future roles in movies for the rest of her life. Simply put, she was likely threatened by her community that this would be considered an unconscionable sin which would be inexcusable and be held against her forevers. This is our theory and it has been a systemic problem with many concerts being cancelled for their Tel Aviv or Jerusalem appearances which has been effective for many newer bands while many of the old rock-n-roll bands have simply ignored or stated outright that they will perform in Israel, BDS be damned. Now, as our title stated, what can Israel do to mitigate this effect? There are many who claim that Israel need invest far more funds in external affairs to fight against these efforts and work to put the Israel reality story into the public discourse. This would be a possible means for Israel to combat this and there are many who are out there, us included, telling the Israel reality and standing up for Israel. The question to ask is how much Israel should put into such a program to make it successful? Well, at least as much as is invested against Israel. Were Israel to do such, then the Saudis, the NGOs, the European Union and many member nations, the United Nations, and numerous billionaires will simply double down and Israel cannot keep pace and still have any funds left for anything else, especially for the IDF. Israel cannot keep pace with the funds put up against her so that is not an issue. Even if Israel were to triple the funds and efforts into such policies, they would be but a small drip compared to the tsunami her detractors are spending. Perhaps having those people with famous names could be encouraged to stand stronger and louder in their support would help. The other side has the trump numbers and could bring far more people to the floor through intimidation or simply depending on true believers. The only thing Israel can do to protect herself is to continue to be the most moral nation and work within the systems which already give her legal right to the lands west of the Jordan River. What would likely surprise even the supporters of Israel is that it would be legal for Israel to deport the Palestinian Arabs into Jordan from the entire Shomron without so much as a how do you do. This would be just as legal as the deporting of the German people in the lands Poland was awarded after World War II and from the lands France was awarded after World War I. It would be legal just as the two populations which were exchanged between India and Pakistan after the founding of Pakistan. There were a number of population exchanges made in the world within the last century and should have occurred when Israel liberated the Shomron and Gaza Strip during the Six Day War in July of 1967. The Arabs in the Gaza Strip would have been displaced into the Sinai Peninsula or into Egypt. Technically, under the rules of warfare, since Israel was responding to a breach of the treaty by Egypt who blockaded the Straits of Tiran in the Red Sea which was a casus belli as an act of war. This made all the actions by Israel during the Six Day War and the Yom Kippur War legal and Israel should have been permitted to retain all the land Israel deemed necessary or desirous for her defense and future requirements. This means that Israel could have retained the entirety of the Sinai Peninsula and forced the Egyptians residing there to move across the Suez Canal into Egypt and that would have been legal. This is how the Rules of War read since they were agreed upon through World War I. Since then, the main alteration has been that lands gained in a defensive war may be held until decisions are reached between the involved nations in a formal peace treaty. The aggrieved nation which was attacked, they are permitted to retain the land they gained should this be coded in the peace treaty and cannot be forced to return the lands otherwise. This is why Israel could only be required to return land and not all the land after the Six Day War as encoded in UNSC Res. 242. The Egypt treaty surrendered the formerly occupied Gaza Strip and the peace with Jordan surrendered all of the formerly occupied Shomron, the lands west of the Jordan River. Once the people in Gaza had been moved into Egypt and the people in the Shomron moved into Jordan, that should have been the end of everything. The world decided they could not live with Israel being permitted the same rights of other nations which had been established over the years. Israel had been promised the lands west of the Jordan River which she possessed when founded in May of 1948 until she was attacked by six Arab armies intent on the eradication of the Jewish State and genocide of the Jews within the nascent state. Israel survived that assault but lost the area of the Shomron and Gaza Strip including half of Jerusalem including the entirety of the Old City. The Jews residing in the lost territories were forced from their properties mostly without taking their belongings and their homes were gifted to the favored of the King of Jordan. Jordan then destroyed the Synagogues and the Mount of Olives cemetery and other Jewish properties. The marker stones from the Jewish cemeteries were taken and used as paving stones and for making bathrooms intended as insult to the dead Jews. When Israel regained the Old City and the Temple Mount all of the holy sites were found in poor repair and the entirety of Eastern Jerusalem was found to be mostly a ruin with everything broken and in disarray. Since then, Israel has revitalized the entire region and repaired the holy sites, rebuilt some of the Synagogues and some are still in the planning stage and will be rebuilt with time. Some were so completely destroyed that they are not being rebuilt. Water systems and electrical systems have been repaired and improved and waste systems repaired with new treatment facilities built. The entirety of East Jerusalem has been modernized while taking care to keep as much of the original structures intact or repaired as necessary. The Palestinian Arabs were established with one intent, the complete destruction to destroy all of Israel. This was in the original charter of the PLO and remains in the charter of Hamas and Islamic Jihad while the Arab League still calls for the destruction of Israel and Iran has stated their desire to destroy Israel as well as the United States. Perhaps the United Nations would do something unprecedented and honor their Charter, in particular, Article 80 which claimed that they would enforce the Mandate System which would imply that they would recognize the lands west of the Jordan River as belonging rightfully to Israel. Such a decision might end the problems which have been behind the Arab-Israeli conflict should the United Nations in the Security Council recognize the Jordan River as the eastern border of Israel and support the resettlement of the Palestinian Arabs either in Jordan or allow them to choose whichever Arab nations or nation which would accept them allowing their removal from the land of Israel, something eminently legal under the laws of war. 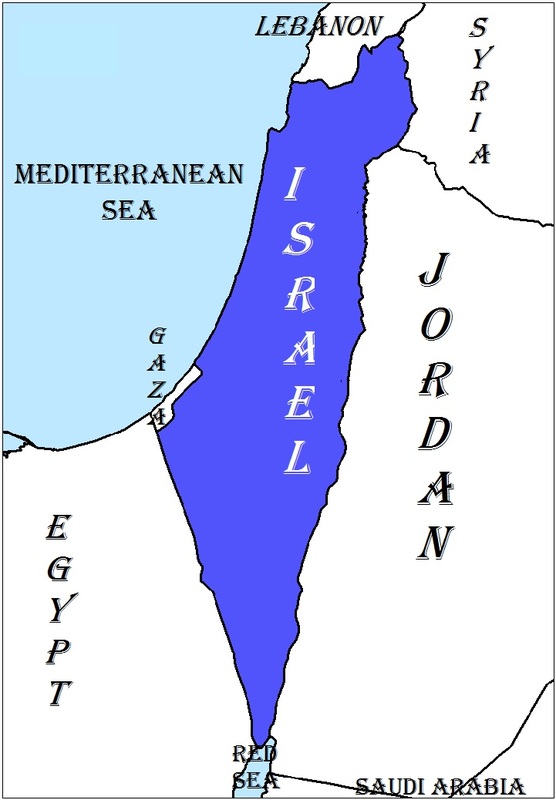 For those who wish to apply the Geneva Convention to the Arab-Israeli conflict, since the lands of the Shomron were occupied by Jordan and Jordan definitely attacked Israel as part of the Six Day War making Israel the aggrieved nation, Israel is the only nation with a true claim to the lands west of the Jordan River. Facts can be sticky objects, and these are the facts. As for Gaza, Israel surrendered claim to Gaza and Hamas took Gaza in a coup, thus if the world really desires to make a Palestinian State, Gaza would serve well and it could be called one of many names. Allow us to suggest a few; there could be Hamastan, Islamasstan, Gazastan, Terrorville or Hamastania. President Trump, please read some history and agreements, which defined the entire creation of Israel. Once you understand the history, then you will understand that Israel has had so much already stolen that to take more would be literally criminal. The first place you should start is with the San Remo Conference. This was the first international conference to discuss further the concepts and promises made by the Balfour Declaration, something we assume; hopefully not wrongly, you already are familiar with forward and backward. Just in case you are not familiar with this document, you can use the link here. At San Remo, the world made their initial commitment. This was followed by the Treaty of Sèvres where further discussions were held and the Mandate System finalized. This was finalized in the League of Nations who gave the British the Mandate over what became Jordan and Israel. Read these and it will confirm the gist of our summary which follows. The British were granted lands in which to establish the Jewish State. They took the liberty of deciding that they were not required to establish the Jewish homelands in all of the territory and instead decided they would make an Arab homeland as well. The British decided to divide the lands evenly by British standards. Their idea of evenly was to divide the lands down the Jordan River and straight south from the Dead Sea. They took the slightly larger part, 78% of the Mandate, and formed Transjordan, which later became simply Jordan, and gifted the lands to the Hashemites whom they owed favor from World War I. They further decided that the Jews were not prepared to have their own state, so the British continued to rule the lands west of the Jordan, the 22% they promised would never be divided further when they took most of the lands to form the Arab state of Jordan. The Arabs rioted often and as long as they targeted the Jews, the British watched on and when they started to approach the British they would fire a single shot and the Arabs would disperse. The British, the ones who promised the lands would never be further divided, did actually try to keep their word as well as prevent the forming of the State of Israel when they voted against United Nations General Assembly Resolution 181 (UNGA Res 181), which passed easily laying out dividing the 22% of land left into another Arab state and a Jewish state with the better lands given the Arabs and the Negev Desert making up over 50% of the Jewish State. The Arab League rejected this agreement thus, as one of the legal party, voiding the entirety of UNGA Res 181 and negating the proposed boundaries. This negation returned everything to the conditions before the proposal of UNGA Res 181, meaning the British promise that all the lands west of the Jordan River were designated for the Jewish state. That was the situation legally on the morning of May 15, 1948, or the evening before which was the start of the 5th of Iyyar, 5708. When Israel declared her independence on the evening of 5th of Iyyar, 5708, her borders were exactly what the British had promised in exchange for the theft of 78% of the Mandate to gift the Arabs another nation. That morning began what is euphemistically called the Israeli War of Independence. A more accurate title would have been the Israeli War for Survival. Six Arab armies from the nations of Jordan, Egypt, Syria, Iraq, Lebanon, Saudi Arabia along with the Arab League Militias led by the Mufti of Jerusalem and World War II Nazi ally Mohammed Amin al-Husseini (محمد أمين الحسيني‎ Arabic) as well as detachments from Algeria, Pakistan, Sudan and Yemen attacked Israel from every border the morning she came into existence. There were additional forces usually simply referred to as irregulars some of which represented the Muslim Brotherhood and components of the Arab League as well as other terror and Islamist organizations and groups. This was how Gaza was occupied by Egypt and Judea and Samaria partially occupied by Jordan, an area they renamed West Bank to remove the Jewish designations and honestly known as the Shomron by Jews and Israel. The Arabs have their state and it is Jordan. These occupied areas were liberated in the defensive wars of 1967 (Six Day War) and 1973 (Yom Kippur War). Israel successfully defended her lands in these conflicts. Since then Israel returned the Sinai Peninsula to Egypt when they made peace. This satisfied the requirement in United Nations Security Resolution 242 (UNSC Res 242) which was adopted unanimously by the UN Security Council on November 22, 1967, in the aftermath of the Six-Day War. It was adopted under Chapter VI of the UN Charter. The requirement was that despite Israel wining a defensive war brought on despite repeated cries for the Arabs to reconsider while the world sat silently waiting for Israel to be destroyed, for Israel to return part of the lands gained, not all of the lands. Israel survived and thrived but, unlike normal nations, was not permitted to retain the spoils of a defensive war in order to prevent further wars. Israel was demanded to return lands, not the lands or all lands, simply lands while establishing for themselves “Secure and Recognized Borders.” Once Israel had returned the Sinai Peninsula, she had satisfied the demand for the return of land. Israel annexation of the Golan Heights was done to establish “Secure and Recognized Borders.” Since the Shomron was initially part of Israel until the illegal occupation by Jordan, there should be no problem, but the world cannot allow Israel to live in peace. Instead, there came the invention of the Arab Palestinians who were established by the PLO, Arafat, the KGB and the Arab League in June of 1964 with the inauguration of the PLO terror group. The plan was to use the history of the Jewish People against Israel by adapting it, with a few flourishes, replacing the Jewish People and Israelites with the pretend Arab Palestinian entity. One prime example of a flourish is the claim they inhabited the land with the Canaanites for nine-thousand years and furthermore, Abbas also claimed that the fictitious “Canaanite-Palestinians” were the creators of the modern-day alphabet six-thousand years ago (watch video below), a thousand years before any modern written language has been recognized by anthropology studies of ancient civilizations. The Shomron is an integral part of Jewish and Israelite history and the heartlands of Israel. This is history and verified by historical records. But the levels of deceit which is beyond those attempting to destroy Israel by any means and no matter the cost to civilization has never been reached, there is no limit to their perfidy and lies. There is a simple set of maps that prove what is and is not belonging to Israel. Below is a map of the original Twelve Tribes and the lands they ruled which spanned both sides of the Jordan River. The Promised Lands were those west of the Jordan River but with the assistance of Moses intervening to permit tribes to remain in lands east of the river where they found good grazing lands for their cattle, they were permitted these lands providing they were the point of the spear leading the other tribes into battle to take the Promised Lands, and then they could return to these lands. They built shelters for their families, fences for their cattle and led the other tribes in the taking of the lands and vanquishing completely the Canaanite tribes. 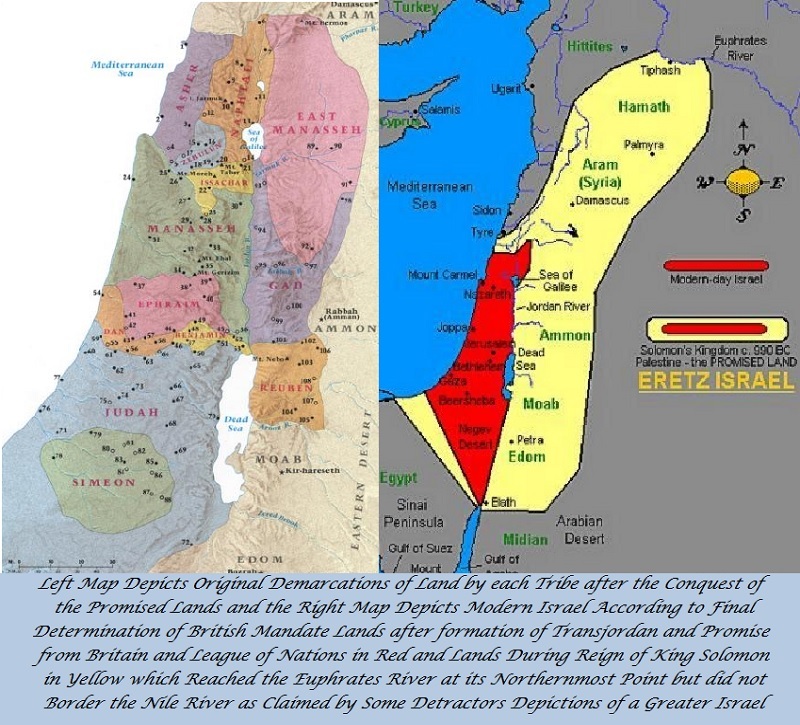 The other side depicts the initial lands promised and becoming the land of Israel upon her declaration of independence in red on the right with the extended Davidic-Solomon Empire in yellow, which came after the defeat of the Phoenicians and Philistines by King David and King Solomon. The Hebrew Empire reached from the Euphrates River in what is today northern Syria near the Iraqi border through to the southern edge of the Negev where it meets the Sinai Peninsula and the Egyptian border then, just beyond where it exists today. Israel is not requesting those lands they initially inhabited though the initial British Mandate, which had been intended to give the Jews the lands as, estimated to match their initial lands. Unfortunately, the religiously guided and writers of the Balfour Declaration and San Remo Conference and other related treaties and papers following World War I were not the men it was decided should enact what they dreamed. The people who were tasked with the implementation of the British Mandate were more beholden to the promises the British had lavished upon numerous Arab families during the war and left the crumbs of what was considered worthless land, the prime real estate east of the Jordan River had been reserved for their Arab friends the Hashemites, so leaving the rock strewn hills, swampy lowlands and southern desert lands to the Jews, areas that had been tried and refused to provide succor to those who resided thereupon, allowing for a few subsistence farmers and a shepherd or two per hundred miles with the slimmest of herds to survive along with a paltry number of residents to remain and live in Jerusalem, Hevron, Shechem, Tiberius, Caesarea and Akko; all but Akko consisted of predominantly Jewish and Christian residents. The demands of the world have been more than satisfied. The map below is what, as things now stand, should be the final and definitive map of the modern state of Israel. This map includes the Golan Heights, the lands west of the Jordan River; border Lebanon along the internationally recognized Blue Line as confirmed by the United Nations, borders Egypt along their agreed upon and recognized border between the Sinai Peninsula and the Negev Desert, and the Mediterranean Sea to the west. It should be noticed that Gaza is not included as part of Israel though, according to the agreements from after World War I, these lands were included within Israel. The reason for this is Israel released all claims to Gaza turning it over to the rule of the Palestinian Authority in August of 2005 and by early September the final withdrawal of the last IDF forces was complete. Israel no longer controls, occupies or otherwise has any claim having surrendered Gaza to the Palestinian Authority. Subsequently, the Palestinian Authority lost their rule and control over Gaza to Hamas in a bloody coup in 2007. Since then Gaza has been ruled by Hamas with Israel only invading when it became necessary to respond to excessive assaults and rocket fire by Hamas targeting Israeli civilians. These attacks were initially limited to the southernmost residents in Israel but over time and with assistance from Iran, the ranges of these projectiles has greatly increased and will soon be capable of threatening all of Israel. The last war with Hamas and Islamic Jihad, the terrorist masters of Gaza, they targeted the suburbs of Jerusalem and Tel Aviv, the next war it may well be Haifa. Israel cannot surrender any further lands as to do so would be suicide. That is the truth. If there is to be a deal, it should be to permit those Arabs desiring to relocate to do so without facing death threats from the Palestinian Authority or from Hamas and Islamic Jihad. Israel would offer top price for their properties and possibly a bonus might be offered. The same offer should be given to the Arabs residing within Israel as well and in Gaza. This would reduce the overcrowding that always appears to explain why Hamas must fire their rockets from School tops and the roofs of clinics and apartment houses. These would be the closest Israel can expect and could be made into “Secure and Recognized Borders.” Israel did surrender the Sinai Peninsula and Gaza, no more can or should be asked of her. The United Nations demanded Israel surrender lands, not all the lands or even the lands, and Israel has met this standard and now need to be left to her own safe boundaries. President Trump, you claim not to be a politician and to be the one to bring a new age to Washington. Your claim is to drain the swamp and follow your own path ignoring the ‘Deep State’ as part of your cleaning of the mess the United States faces. As you may have already seen, the State Department is probably the most infected of your departments when it comes to people with their own policies and the desire to implement them whether the President agrees with them or not. The problems you had with Secretary of State Rex Tillerson were not completely of his making, though he was the perfect fit for the State Department. Allow us to give you a little history on the State Department. The State Department advised President George Washington, President John Adams and President Thomas Jefferson to pay the tribute to the Barbary Pirates. Eventually, President Jefferson, a noninterventionist if ever there was one, to intervene and fight the Barbary Pirates instead of paying the ever-increasing tribute. The State Department backed the Soviets and Communism while now they back the Arabs, as they are Arabists, just like Rex Tillerson is. You have already shown more backbone than other Presidents, as you kept your promise to recognize the true and eternal capital of Israel, Jerusalem. This was the act of a businessman, keeping his word, and not the act of a politician, whose words are usually worthless when they become uncomfortable or difficult. Do not suddenly become a politician, though becoming another member of the swamp would be the easiest path for you, stand for what you know is correct from what you learned back in Sunday School and any Bible reading you have done since. It is time to uphold the promises which the United States also singed onto under the Anglo American Treaty of 1924 which made the United States a signatory in the Mandate System and an enforcer of the British Mandate as well as the others made by the League of Nations. Imagine that, a President actually enforcing a treaty that was ratified by the Senate February 20, 1925. If you are half the businessman you claim to be, then you know that your position requires you to fulfill all actions to as demanded by the Constitution. A treaty ratified by the Senate is, under the Constitution, the law of the land and as such must be upheld by the President. Uphold the treaty and permit Israel some strategic depth, which required all of the lands west of the Jordan River as promised by the British Crown and signed onto by the United States under the Anglo American Treaty of 1924. Doing so will guarantee you a great Presidency which will be considered amongst the greatest in the history books. Remember the promise from Hashem from Genesis 12:3 where it states, “And I will bless those who bless you, and the one who curses you I will curse.” The choice stands before you, which way will you choose.